Wind-assisted propulsion for commercial ships is a dedicated research theme at the Ship Hydromechanics section of Delft University of Technology. The use of wind energy as an auxiliary form of propulsion has again become of great interest as a possible response to volatile fuel prices and increasingly stringent environmental regulations. A sound performance prediction for these hybrid ships is one of the key prerequisites for further uptake by the shipping industry. Wind-assist research at Delft University of Technology is divided between two Ph.D. projects: focused on the hydrodynamics (Nico van der Kolk), and the aerodynamics (Giovanni Bordogna) of wind-assisted commercial vessels. The project is conducted in close collaboration with the Polytechnic University of Milan, Damen Shipyards, Dykstra Naval Architects and MARIN, among others. 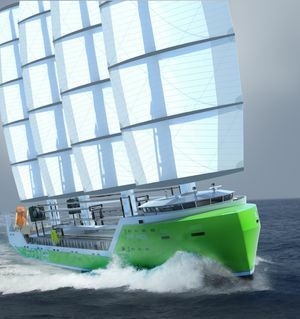 The final goal of the project is to elaborate the experimental data into an accurate, flexible, and easy-to-use performance prediction tool for wind-assisted ships. This modelling tool will provide designers and researchers the ability to readily explore the potential of this promising technology..